Located in Center City, Morton Casway’s Celebrity Room was popular in the 1940s. It played host to a number of jazz and blues greats, including Fats Waller, Mary Lou Williams and Art Tatum. The nightspot’s booker, Nat Segall, “is the only prospect shopping around the center of town for a new spot. Segall, the former owner of the Downbeat, found his sweet spot. He moved on and became the booking agent for the legendary Showboat. 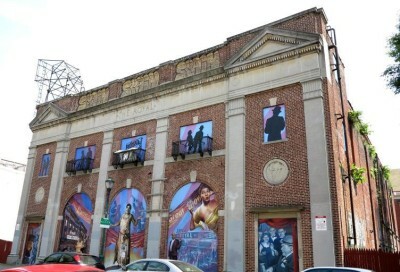 Built in 1919, the Royal Theater was called “American’s Finest Colored Photoplay House.” The 1,200-seat theater targeted an African American audience, featuring movies with black stars and performances by prominent black entertainers such as Fats Waller, Bessie Smith Pearl Bailey, Cab Calloway and the Nicholas Brothers. South Philly residents were the Royal’s most loyal patrons and participated in talent shows and radio broadcasts. Business owners received increased foot traffic after Royal shows. But by the 1960s, the threat of the construction of an expressway in the neighborhood (that never materialized) and civil rights legislation, which allowed blacks to move freely and patronize other entertainment venues, decimated the Royal’s neighborhood and attendance. The Royal closed its doors in 1970. It is listed on the Philadelphia Register (1976) and National Register of Historic Places (1980). The Royal Theater and adjoining parcels were purchased by music mogul Kenny Gamble from the Preservation Alliance of Greater Philadelphia in 2000 for $250,000. UPDATE: In 2016, Kenny Gamble’s Universal Companies sold the Royal Theater. The facade is all that remains of the historic landmark. It, too, would have been demolished but the Preservation Alliance of Greater Philadelphia holds an easement.